Surprise! 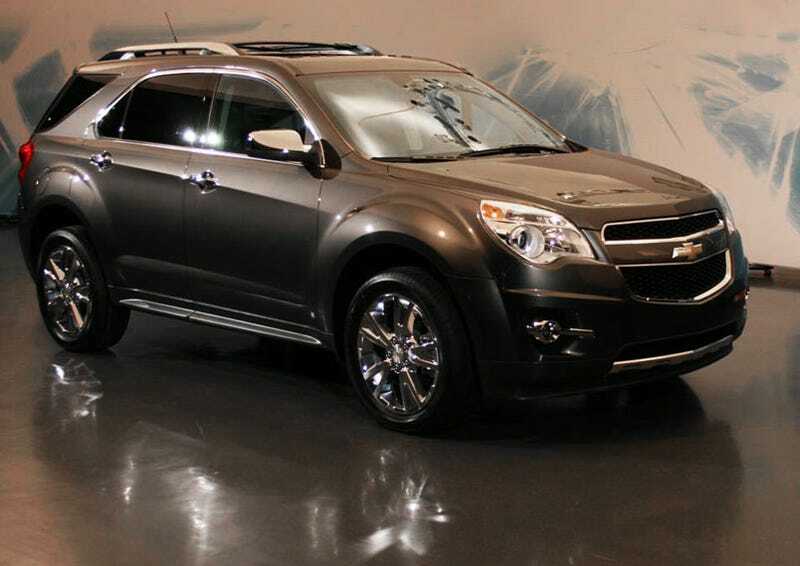 Here's the 2010 Chevrolet Equinox scheduled to make its debut at the 2009 Detroit Auto Show. Bet you didn't expect to see this on a Sunday morning did you? The all-new 2010 Chevrolet Equinox builds on the the previous model with more of what segment buyers are looking for across pretty much every aspect. Better interior, better styling, better engines, better transmissions and smarter features. You can bet GM will be trumpeting from the heavens the new Equinox's 30 MPG highway rating when optioned with the direct injection 2.4 liter four cylinder and standard six speed transmission, but we've seen the little SUV in the sheetmetal and we're happy to say the Equinox isn't just a fuel economy figure. The new Equinox takes styling inspiration mainly from the Chevy Malibu, but there are hints of other cars in the lineup as well. Outside we see the Equinox gets the new Chevy face, first seen on the Malibu, with a bit more curvaceousness in the headlights and a bit of extra chrome around the fog lamps. The sides get a heaping helping of styling with big fender flares over your choice of 16, 17 or 18 inch wheels, and a strong shoulder line runs front to back to link everything together. We think the Hofmeister kink at the back of the rear door glass is both amusing and cool looking. The design of the doors has been changed so they extend all the way though the rocker panel, virtually eliminating stepover height. The rear... looks like an SUV. From a mechanical standpoint, the Equinox will come with a duo of engines, both sporting fancy direct injection technology and fuel sipping credentials for their size — there's even an "Eco" button on the center console which changes the fuel mapping and shift points to give you an extra mile per gallon or two. You get your pick of a 2.4 liter inline four with 185 HP and a 3.0 liter V6 with 255 HP. The I4 puts down 21 city, 30 mpg highway, while the V6 is a bit more thirsty at 18 mpg city, 25 mpg highway. Both of those engines get backed with their own standard six speed transmissions with front wheel drive standard, all wheel drive optional. Nobody buying in this segment cares about those greasy bits though. The interior, on the other hand, is something that will demand consumer attentions. Again, the Equinox takes inspiration from the Malibu inside, with a similar dashboard layout, contrasting materials and stitching, and handsome details.. Amusingly though, it also takes its gauges from the perennially just around the corner 2010 Camaro. GM is also pretty excited about the ambient lighting peppering the interior, though lighting never really has rung our bell. What is bell-ringing are the seats, the gadgets the storage and the legroom. Those seats are supportive and comfortable, with excellent leather and plenty of adjustability to get everyone where they want to be, obviously we can't make a call on how good they are after four hours of drive time. Between those front seats is a cavernous storage bin deep enough for a couple of full size laptops and houses the USB port and a 12 volt power port. Front and back passengers get huge amounts of legroom, and with the second row keeping the sliding and reclining 60/40 split bench it's practically limo-like in the rear. Order the optional independent dual rear flip-up DVD players and you'll never hear a peep from the back. Even with the rear seats pushed all the way back, cargo room is downright generous. And getting to that cargo area gets clever as the power lift gate is now programmable. Silly until you think about it — you can program the maximum opening height so it doesn't smash into your low clearance garage door. Overall first impression without having driven it or lived with it for a while is positive. The styling will leave some wanting more but the mileage figures are impressive for this segment and the interior is, dare we say it, actually pretty nice. We're looking forward to seeing how this new crop of direct injection engines and their six speed transmissions perform out on the road. Look for the debut in January at the Detroit Auto Show and until then, enjoy the complete details below. "At a time when customers are so concerned about the fuel efficiency of their vehicle, the Equinox delivers," said Peper. "It offers the roominess and capability of a crossover with great fuel economy. Equinox will provide customers a vehicle filled with refinement, comfort and great value." "With the 2010 Equinox, we focused on appealing to the senses – from the overall design to the feel of the interior," said Peper. The design features Chevy's signature global face – the two-tier grille and prominent gold Bowtie insignia. Strong fender shapes, a distinctive premium roofline, wraparound headlamps and dual round taillamps are additional elements that define Equinox as a true Chevrolet, Peper said. "The new Equinox blends function and style into a very sporty, yet upscale compact crossover," said Ed Welburn, vice president of GM Global Design. "Both the exterior and interior surprise and delight with careful attention to detail." Equinox's rocker panels are integrated into the doors to make it easier to get in and out of the vehicle. They narrow the area over which a passenger must step, offering protection for pant legs that could brush against dirty rockers. Also, the select use of chrome trim and flush-fitting "exposed-edge" windshield and rear glass reinforce Equinox's build quality and reduce wind noise. A "floating" center stack houses a multitude of ergonomic comfort and convenience controls. Contemporary, ice-blue ambient lighting – featured within and surrounding the center stack, encircling the center-console cupholders and within the door pull cups – accentuates the cabin. The front and rear seats, which include cloth and uplevel, perforated leather-trimmed offerings, were developed to help deliver best-in-class comfort. The Equinox's cabin is notable for its quietness. Noise-absorbing elements are built into the chassis, engine compartment and interior. The rack-mounted electric power steering system provides greater fuel efficiency of on 2.4L-equipped models that saves nearly 11 miles per tank of gas, or about 572 miles per year (assuming one fill-up per week). With the Equinox's estimated 30 mpg on the highway, the electric power steering system saves the equivalent of approximately one tank of gas each year. "With the outstanding interior execution and comfort, the stunning exterior design, numerous chassis improvements, and the connectivity to the outside world, the new Equinox is the favorite ride among our engineers," said Tim Herrick, chief engineer. "I have to pull the keys out of their hands in order to take it for a spin myself." Chevrolet is one of America's best-known and best-selling automotive brands. With the largest dealer network in the United States, Chevrolet delivers more-than-expected value in every vehicle category, offering cars and trucks priced from $12,120 to $103,300. Chevy delivers expressive design, spirited performance and great value with standard features usually found only on more expensive vehicles. More information on Chevrolet can be found at www.chevrolet.com. "We first introduced direct injection in North America in the 2007 Saturn Sky Red Line and the Pontiac Solstice GXP," said Tom Stephens, executive vice president, GM Global Powertrain and Global Quality. "We've been rolling out the technology across our portfolio as quickly as we can so that our customers will have additional fuel savings options. Direct injection is a state-of-the art engineering solution because it enables improved fuel economy and lower emissions without sacrificing power." GM's direct injection push is part of a larger effort to implement multiple fuel-saving technologies across its 2009 portfolio. The all-new 2009 Chevy Traverse crossover, for example, enjoys best-in-class highway fuel economy (24 mpg for FWD models) of any eight-passenger SUV, thanks in part to its 3.6L direct injected V-6 engine with variable valve timing. In 2009, GM expects to sell 500,000 vehicles with gasoline direct injection. GM's 2009 domestic car and light truck lineups will use 700 million fewer gallons of fuel than the 2008 lineup, during the life of the vehicles, saving $1.4 to $2.1 billion in fuel costs, assuming gas prices of $2 to $3 per gallon. It's estimated that GM's 2010 lineup will add another 1.1 billion gallons of fuel savings and $2.2 to $3.3 billion, relative to the 2008 lineup. The new 2.4L DI engine delivers an estimated 180 horsepower (134 kW) @ 6700 rpm and 172 lb.-ft. of torque (232 Nm) @4900 rpm. It uses technology based on GM's other four-cylinder direct injection applications, but with unique features designed for its specific application. This includes an 11.4:1 compression ratio that helps build power, slightly dished pistons that increase combustion efficiency and injectors with an application-specific flow rate. The new 3.0L DI engine is a variant of GM's family of high-feature DOHC V-6 engines that also includes GM's 3.6L DI engine in the Cadillac CTS – an engine named to Ward's AutoWorld's 2009 "Ten Best Engines" list for North America, for the second consecutive year. In a conventionally port fuel injected engine, air and fuel are mixed before they enter the combustion chamber. With GM's DI engines, fuel is sprayed directly into the cylinder where it is mixed with air. As the piston approaches top-dead center, the mixture is ignited by the spark plug; and when the fuel vaporizes in the cylinder, the air and fuel mixture is cooled. This enables the use of a higher compression ratio in the combustion chamber, which improves the engine's power and efficiency. On cold starts, direct injection can be controlled to create a richer air/fuel mixture around the spark plug, making it easier to ignite in a cold engine. This results in a smoother operation of the engine and lower emissions during the cold start and warm-up, when most harmful tailpipe emissions are typically created. GM's direct injected engines reduce cold-start vehicle emissions by 25 percent. Because the fuel is injected directly into the combustion chamber, direct injection uses higher fuel pressure than conventional fuel injected engines. This is enabled by a special high pressure pump driven by one of the engine's camshafts.